Expensive, but you get what you pay for; not just for surf players, it's a brilliant all-rounder and drop- dead gorgeous, too. Excellent all-rounder, tonally. Stunning finish. Superb build. Effortless operation. The Bigsby is a full-blown antique but for light shimmer, not to mention a subtly more open-sounding tonality, is there anything better? Since 1996, Nik Huber has been crafting stellar guitars from his small factory south of Frankfurt. They've always been superb, but his recent instruments are hitting the bullseye with remarkable regularity. Sure, they owe inspirational elements to other great brands, but Nik's designer's sensibility and musician's understanding means his guitars contain enough of his own DNA to satisfy even the most critical eye. "The Surfmeister's weight is kept down due to the bulk of the mahogany being machined away inside"
The Surfmeister is his latest creation. Essentially a semi-hollow Dolphin model, the prototype appeared at last year's NAMM and debuted properly at Frankfurt in April. 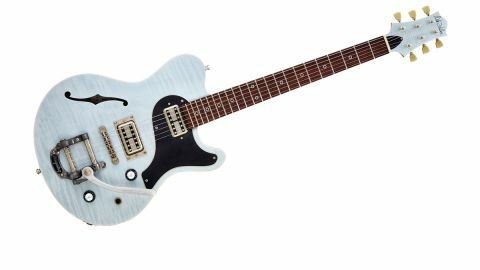 Huber calls it his "rock 'n' roll" guitar and you can see exactly what he means: it brims with cool. Ours is a stunning see-through metallic Ice Blue semi-gloss on a flame maple cap with matching headstock overlay. Body and neck are mahogany, blown over with the thinnest whisper of matt nitrocellulose - Huber calls it "open pore". Nickel hardware has been aged to look not unlike pewter, and includes a Bigsby vibrato, tune-o-matic bridge and Harry Haüssel's 'TroneBucker' Filter'Tron-style pickups. Tuners are Schaller's high-end Grand Tune open-gear tulip-button style, and the same German company's Straploks complete the picture. The metal even extends to real silver fret marker rings. The overall picture is one of natural beauty; the design is new, and yet pleasingly familiar. Running our hands over the medium depth, slightly V-profile neck is a drag-free experience - in every respect. It's remarkable in that it's not remarkable at all. You don't really think about it, you just get on with playing, and we can't think of a better recommendation than that. With a 305 to 355mm (10- to 14-inch) compound radius the rosewood fingerboard and 22 perfectly finished frets offer everything the bluesy, surfy, rockabilly player might want in the way of string bending, vibrato, upper-fret access and so on. "There's a darker element that works almost innately with a Fulltone OCD pedal or similar"
The Surfmeister's weight is kept down due to the bulk of the mahogany being machined away inside, with just a centre block remaining to provide rigidity and strong string-to-body contact. The Bigsby, never the most responsive of vibratos, does its subtle job commendably - and looks fabulous in this context. With a German guitar what better amp to fire it up with than a Hughes & Kettner Puretone, one of our favourite EL34-equipped combos? A guitar like this is all about tone, so big clanking chords, dark 'clean but slightly dirty' riffs and smooth controlled leads is what we're after. We are consistently floored by what a great pickup the Filter'Tron is, and Harry Haüssel's take on it is superb. Although you can get away with really clean lead tones since the sound is so big and bright, there's a darker element that works almost innately with a Fulltone OCD pedal or similar. Another thing that would suit it is to leave something such as an Xotic EP Boost permanently on, so you can ride the volume pot for infinite clean-to-crunch gradation. Balance is perfect between neck and bridge pickups, and each has a sound that's personal and distinctive - Huber calls it "smacking and bellied". Matching our 'control' ES-335 for volume and fatness, the Gretsch-like twang adds that something extra that might tempt you to use it over the Gibson on a recording date - especially since the tone control's push- pull coil-tap adds another layer of twang to this already resonant guitar. Yes, it's expensive, but our bet is that Huber is one of the few non-mainstream makers whose guitars will hold their value and even appreciate over time. Given its stunning quality, fabulous looks and effortless operation, we'd say it's worth every penny. From form to function we can't fault it, and if the idea of something a little different floats your boat, too, get saving because every one of these beauties that hits our shores will be snapped up like there's no tomorrow.